AirAsia India recorded an INR 28.8Cr loss for the second quarter (Q2) of FY2014-15 (FY’15), covering the months of July, August, and September. This is the airline’s first full quarter of operations. In this period, the airline added one additional aircraft, which commenced operations on 5th September, 2014. The airline flew only to the southern and northern regions (per FIR) of the country. In the south, AirAsia India flies to Goa, Chennai and Kochi, out of Bangalore. In the north, the airline flies to Jaipur and Chandigarh. Operations to the north commenced on September 5th. AirAsia India had two aircraft. Airline operated to 5 destinations, served by 16 daily flights. This included a single Chandigarh, single Jaipur, double Goa, double Kochi, and double Chennai service out of and into Bangalore. The airline did not fly ‘three way routes’, and stayed as a true point to point carrier in Q2 FY’15. Scheduled to fly 2880 seats per day, deploying approximately 2,200,000 available seat kilometers (ASK) on a daily basis. Flew only to Tier II cities, with the exception of Chennai (a Tier I city). Over the period of three months, destinations were gradually added in phases. In Q2, AirAsia India was scheduled to have flown 1,71,000 seats, but flew only 170,280 seats, as four (4) flights were cancelled / not operated in that period. In that same period, the airline flew a capacity of approximately 97 Million available seat kilometers (ASK). Interestingly, 50% of that capacity was flown in the last 22 days of the quarter. In Q2, AirAsia India operated 946 flights (out of 950 scheduled). 50% of those flights were flown in the last 32 days of the quarter. This implies that the second aircraft, and the month of September, have contributed significantly to AirAsia’s capacity. The airline has two Airbus A320 aircraft, VT-ATF and VT-ATB. VT-ATF was delivered directly from Toulouse. VT-ATB is a used aircraft from AirAsia Berhad. Both aircraft were around 6 months old towards the end of September. These two aircraft comprise 1.2% of the AirAsia Group’s fleet strength, and are leased to AirAsia India at the rate of INR 2.3Cr per aircraft per month. Average aircraft utilisation stands at 11hrs 50 minutes – a somewhat small number due to 12 out of 16 (75%) flights being short, ‘regional’ flights, with an average block time of 1 hour. The average turnaround time stands at 29 minutes, with minimum and maximum of 25 minutes and 35 minutes, as seen in the schedule as of 30th-September-2014. The airline flew 128,089 passengers in Q2 FY’15, which is 13,000 passengers higher than DGCA published data. 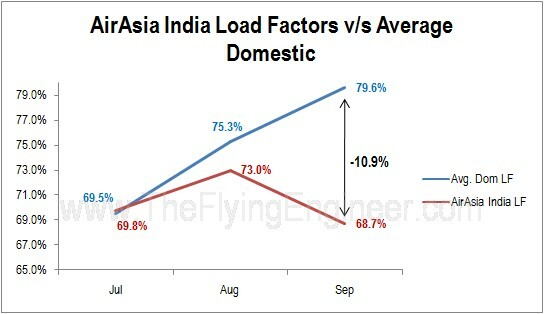 As per AirAsia India, the airline flew with an average load factor of 75% in Q2, while computations based on DGCA published data shows the average load factor as 70%. This large variation can be attributed to either the accuracy of data reported by the airline, or errors at the DGCA’s end. Cancellations as reported by the DGCA stood at 0% for the three months. Among pan-India private operators, AirAsia India had the lowest percentage (based on passengers carried) of affected passengers in July, but the highest in August and September. Considering the small size of the airline, every cancellation and delay will have a large impact on these figures, and this must be borne in mind while interpreting data. AirAsia, though known for its market stimulation, was unable to stimulate its market in September (despite the promo fares for its new routes Jaipur and Chandigarh). September is traditionally the weakest month for domestic air travel. Other airlines were able to stimulate the market better through low airfares, reflective in the average domestic load factors anomalously rising in September over August and July. AirAsia’s load factors in September were the lowest among all domestic carriers. However, AirAsia does not operate on dense routes such as the Tier I and most Tier II cities. Most routes cater to the leisure traveller. With these two factors, the low load factors are explained, though AirAsia’s stimulation drive (or lack of it) does not seem to have had the vigour of its parent company. On average, AirAsia India lost around INR 2,250 for every passenger flown. In comparison, SpiceJet lost around INR 1,000 for every passenger flown, in the same Q2. AirAsia India, which operates out of Bangalore will next be opening Goa as a hub. Effective 17th December, 2014, the airline will commence flights to Pune. One of the challenges to the smooth execution of plans at the airline are regulatory hurdles, which may continue to hamper expansion plans. The airline is expected to receive its next two aircraft in the month of December, taking the total fleet to four (4) aircraft by the end of calendar year 2014. These two aircraft will be used airplanes from the AirAsia Berhad group. AirAsia Malaysian has 82 aircraft on its books. However, compared to last year, when the airline had 66 aircraft, the capacity in Q2FY’15 did not rise, indicating an excess fleet for the same capacity. Some of these 15 aircraft may make their way to India. 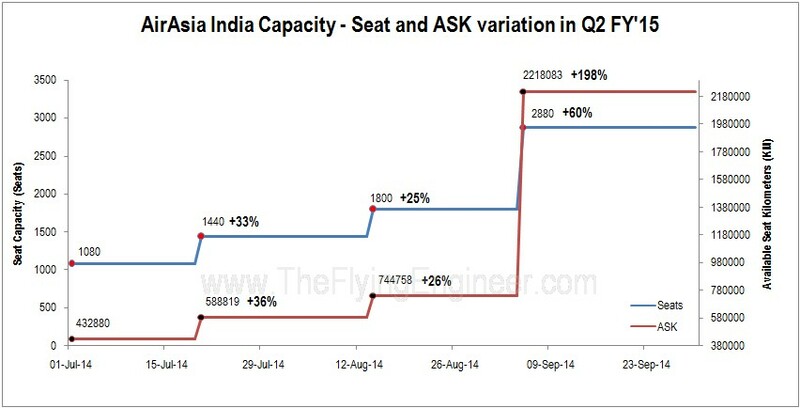 Two additional aircraft are expected to join the airline in Q4 FY’15, taking the count to 6 aircraft. Four (4) new destinations are expected to be announced, after Pune. The airline has also announced an additional frequency to Jaipur, from Bangalore. Based on its winter scheduled as filed with and approved by the DGCA, the airline had hoped to have had a triple Kochi, double Jaipur, double Chandigarh, and a new destination – double Vishakapatnam effective 17th November (see four patterns below, based on DGCA approved schedule. Below). While this is in line with the group’s focus on building scale through frequencies (out of Bangalore), plans at the airline seem to have fallen behind schedule. The airline hopes to fly to Delhi soon. Next few destinations may also include Delhi, Guwahati, and Hyderabad. Airline CEO Mittu Chandilya hopes to break even with the 6th aircraft in Q4 FY’15. Hoped to have broken even in the 4th month / 4th month of operations, despite the board having targeted break even in one year of operations. The four month target would have been at max by mid October. The break even target has now been revised to coincide with the sixth (6th) aircraft, which may be in February – the ninth (9th) month of operation. This however, is in line with the statement of Benyamin Ismail (investor relations, AirAsia), when he had visited India in July. Expressed its initial desire to keep away from mature markets – the Tier I routes. The airline now plans to fly on Tier I routes from/into Bangalore, Mumbai, and Delhi. Targeted a turnaround time of 20 minutes. Average turnaround time at the airline is 29 minutes. Targeted 6 aircraft by end of CY2014, and 14 aircraft by end of FY2014-15. The airline will now have 4 aircraft by end of CY2014, and perhaps 8-10 aircraft by end of FY2014-15. Targeted 8-9 destinations by end of CY2014, and 15-16 destinations by end of FY2014-15. With 5 destinations and one announced, the airline has 6, and can easily meet the target number of destinations. Mentioned a target aircraft utilisation of 16 hours. As per the winter schedule filed with the DGCA, the airline’s three complete patterns have utilisations of 12:05hrs, 13:20hrs, and 14:00hrs. It is unlikely that the airline will touch 16 hours with domestic operations. AirAsia India is still a young airline, and perhaps the foreign investment, and three stakeholders may have slowed things in the airline. Further hampering growth is crew shortage due to poaching and the lure of irresistible offers from middle-east carriers, which has affected many flights for the airline for a good portion of November. DGCA regulations are also to blame for flight crew shortage / handicap. India may have been a shocker, reflecting either on the depth of market study or the unpreparedness for the volatility in the DGCA, and opposition from competition. The forward loads for the airline reportedly appear good and the airline seems focused on building a footprint in the Indian domestic market with the introduction of new routes and frequency increases. With a significant portion of costs out of India at attractive rates, the airline may soar into profitability once the critical masses in terms of fleet size, destinations, and network frequencies are reached. If the airline grows fast enough, it can leverage the backing of the AirAsia group to reach a scale of operations that will threaten established low cost carriers in the country. However, the depth of management at the local level, to handle this growth, is key.